Sega seems to be planning a lot of cool things for the beloved blue mascot’s 20th birthday. However nothing is confirmed as of yet, but if you were worried that there would be nothing to buy to commemorate such an occasion then prepare to be wrong! 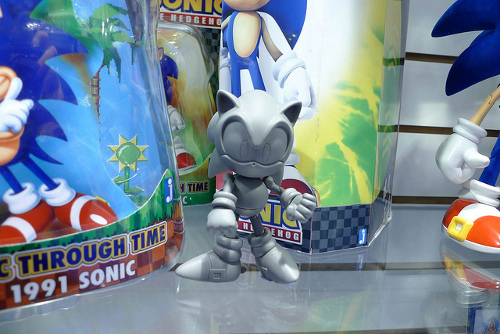 Seen at the JazWares booth at this years UK toy fair, there were a range of “Sonic through time” figures which feature Sonic in all his previous incarnations. But that’s not all! 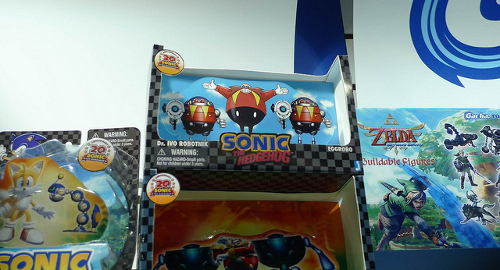 Also there was classic Robotnik whose box sits on top of the modern day incarnation too! I’m excited. This seems like an awesome way to please all fans of Sonic and I for one can’t wait to get my hands on them. Yay more things to spend my money upon frivolously!